Natural bone. Carefully cleaned and prepared, all the bones of a single rabbit are neatly packaged for convenient study. 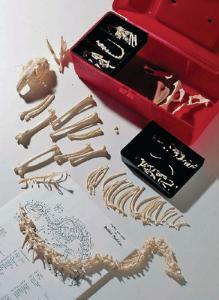 The skeleton comes with a key identifying 73 structures and is packed in a compartmented plastic box. Box size: 11 1/2"L x 5"W x 4"H.